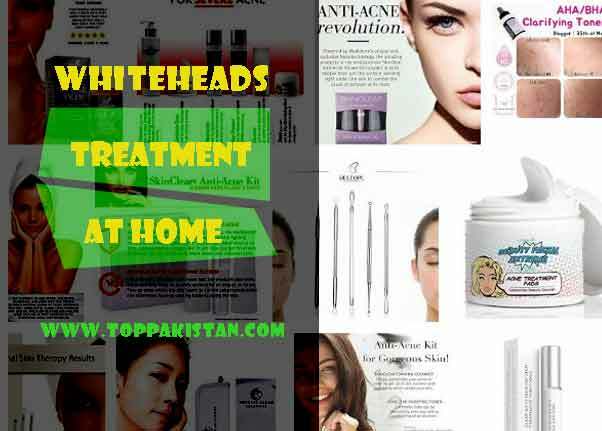 Whiteheads are a manifestation of widening of pores we can do whiteheads treatment at home. Skin pores get filled with sebum and dead cells and acquire the form of Whiteheads. The lack of oxidation keeps them turning into blackheads. Whiteheads are seen as whitish pearly bumps on the skin. Most common areas where they form are cheekbones, nose and other areas where skin is delicate. The “oily Skin” type is more likely than others to invite formation of Whiteheads. There is no proved scientific reason for formation of whiteheads or Blackheads. However, it is believed that hormonal changes during teen years leading to extra production of androgen (male hormones) are a possible reason. These hormones are responsible for making the skin elastic and enlargement of sebum glands. The enlarged glands produce extra sebum oil that in turn causes whiteheads or Blackheads. Before undertaking treatment, it is essential to understand the difference between Whiteheads and Blackheads. The first difference would be the appearance. The process that leads to these bumps is same. However, there is one underlying difference between the two. Blackheads are result of oxidization of hardened sebum oil and are usually formed above the skin. Whiteheads, on the other hand, haven’t gone through oxidization and are formed below skin surface. Once we have understood the difference, it is easier to tackle them. Mistaking them for pimples is the error made by many teenagers and they start popping them. This only leads to rupture of skin leaving it vulnerable to more infections. Thus, treatment of Whiteheads has to be carried out with tried out methods. Thing to remember is that the procedure for removing acne Whiteheads is different than for other types of skin blemishes. Easiest method of treating whiteheads is to keep the skin clean and not to allow pores to turn storehouses for sebum oil and dead cells. This is achieved by deep pore cleansing with beauty grains. The gentle abrasive action of beauty grains mixed with skin tonic keeps the pores free of any excess formation of oils. The home based philosophy of washing your face with plain cold water after every two to three hours is bound to keep Whiteheads at bay. Keep skin free of any grease or oil by washing it with a medicated soap. Oil generating food like pastries, chocolates and aerated drinks should be avoided. In case whiteheads have formed, best way to turn them ineffective is by steam. This unclogs pores. If you wear make up regularly, be sure to remove it before going to bed. Your daily diet should include a large number of fresh fruits and vegetables. Fresh lemon juice taken with a glass of warm water helps the body get rid of toxins and improve its waste management. Do not give in to temptation of popping the pimple. It would spread further if you pop it. Do not use harsh soaps for cleaning. This can make skin abrasive. Use cotton and properly fitting garments to avoid sweating. If you have to remove whiteheads manually, use a whitehead remover instead of popping them. Whiteheads are caused by excess deposits of hardened sebum oil in skin pores. These are different from Blackheads and are also known as milia or comedones. The treatment for whitehead removal is also different as it targets the affected area below the skin directly. Prevention remains the best method, but, if required, treatment should be undertaken only with the best products available. Two ways to treat Whiteheads are to use Benzoyl Peroxide and Tretinoin. Application of these agents should be carried out on affected area only after prescription. Before you launch the application process, make sure that your skin is clean by carrying out deep pores cleaning. Leave the application on for several minutes before washing with cold water. Remember, doing nothing to treat the whiteheads will not make them go away. That would be wishful thinking. If you have not succeeded in prevention, then treatment is a must under the supervision of a qualified medical practitioner.